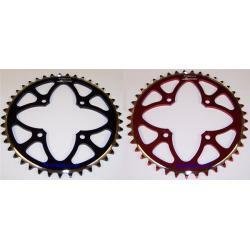 An Apico Evolite extra light rear sprocket for the Montesa 4RT. It has a groove to assist with mud removal, and is available with 41, 42, 44, 46 or 48 teeth. Finished in red or black. Please choose your preferred colour and number of teeth from the dropdowns.